Review: A beautiful fugitive, Grace is on the run and is accepted in the small town of Colorado. Grace agrees to work for them in return. She has a secret and it is a dangerous one. A really unusual film which is filmed on a single sound stage which is rare to see. Paul Bettany and Nicole Kidman work really well together. You do have to be patient with this film and give it time. The only thing I would say is that it is very repetitive and overlong. It could have easily been shorter. At the end of the film you will all be in shock as to what is going to happen. 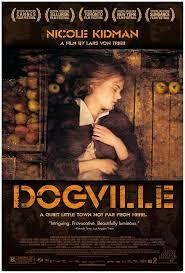 It is reported that Nicole Kidman would never work with Lars von Trier again after completion of this film. At the Cannes Film Festival in 2003 Moses won the Palm Dog Award.